This is a supportive, fun-loving and active yoga class for crawling babies to 24-month-old toddlers and their parent/caregiver. This class is all about your new mover. We encourage each child to embrace their own unique expression of yoga poses while supporting their development and growth. 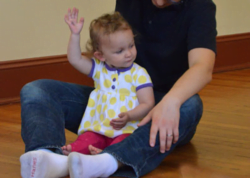 Parents and children playfully move together through poses, songs, and activities appropriate for crawling and walkers. No drop ins, full registration required. Any of your child’s favorite grownups are welcome in this class – ie. mom, dad, grandparent, nanny – and the same adult need not attend all classes.